Erika and Eva Sandoval will be able to share the uncanny connection twins are said to have, but a grueling 17-hour surgery has ensured that they can soon do that safely. The 2-year-old twins from Antelope, California, were born conjoined, but as of Wednesday were separated by surgeons at Lucile Packard Children’s Hospital Stanford. The surgery began on Tuesday and lasted through early Wednesday, hospital officials said. The girls are in stable condition, hospital officials said Thursday, although they remain in the intensive care unit. Erika and Eva's mother, Aida Sandoval, was overcome with emotion as she spoke to reporters Thursday afternoon. In Spanish, she said that her first words upon seeing the girls emerge from their respective operating rooms were, "You're missing your other part, my daughter. Where is your sister?" "It still seems very surreal when I see one on one side and the other one on the other side," Aida Sandoval said. "But it brings us all joy to see them, that it happened, that it was a dream come true for everybody." Dr. Gary Hartman, a pediatric surgeon who led the medical team that performed the lengthy, complicated procedure, recalled meeting the girls' parents, Aida and Arturo Sandoval in 2014. They had just learned that their twins were conjoined and were experiencing "multiple anomalies," he said. "From that moment forward, the goal of the family and of all of the providers here at Packard has been the same goal that we have for all of our children — and that is that we end up with two happy, healthy girls," Hartman said. Anyone who met Eva and Erika Sandoval prior to Tuesday's surgery "can testify to the happy part. That is entirely the fault of the Sandovals," he quipped. "We think that this week we made a big step toward the healthy part," Hartman explained. Aida Sandoval's pregnancy was overseen by Lucile Packard's perinatal center. She was 32 weeks along when the girls were born via emergency C-section, according to Hartman. Eva and Erika have spent the first two years of their lives closely monitored by Stanford doctors and others closer to the Sandovals' home in Antelope. "They were basically joined at the pericardium – which is the sac that covers the heart – joined at the sternum, joined at the liver, they shared parts of the ... small and large bowel, and they shared most of the pelvic organs," said pediatric surgeon Dr. Matias Bruzoni. "So for us it was a big challenge, but little by little and with the help of a lot of people … we were able to, from the top down, finally separate them." On Tuesday, too, Eva and Erika's surgery depended on about 50 experts in pediatric surgery, orthopedics and anesthesiology as well as plastic surgeons, radiologists, urologists, and more. Bruzoni said that once the girls were separated, the medical team split into two groups for Eva and Erika's reconstruction phases, which lasted longer than the separation. "Everyone is very focused on the separation and all the questions are about the separation," Hartman said. But it "doesn’t matter if you get them separated, if you can't get them reconstructed and get them closed." Hartman admitted that he was extremely concerned about Erika, the smaller twin. "She basically kept getting smaller. The more calories we gave her, the bigger Eva got," he said. 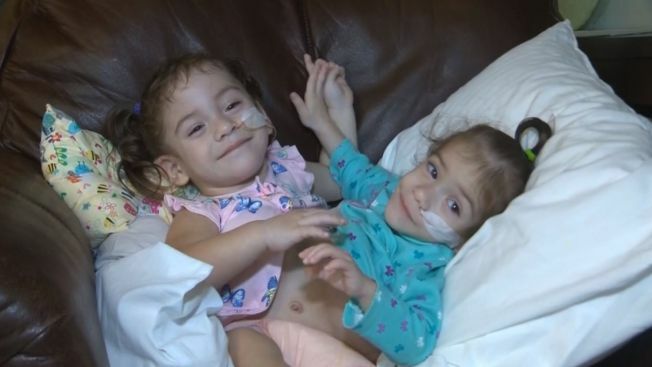 Doctors were worried about her ability to make it through the "stress of the surgery," but Hartman said the girls were reconstructed so well that Erika has already been taken off the ventilator and is recovering faster than Eva. Hartman joked that he took it upon himself to add levity to the complex surgery. "I wanted each girl to have half of [their] belly button so for the rest of their life they can look at that half a belly button and think, 'That was where I was connected to my sister,'" he said. "So that's the goofy thing." But Aida and Arturo Sandoval stuck by their decision. "Once you see them, you know their personalities are different," Arturo Sandoval said. "They [got to] have their own lives." To that, Aida Sandoval added that it was difficult to watch one child feel sick and seek rest and sleep while the other was healthy, happy and wanted to play. She recalled one of the girls experiencing pain when plastic surgeons used tissue expanders to stretch their skin, but her sister simply wanted to "crab walk." Expressing gratitude to the doctors at Stanford for supporting them, Aida Sandoval said that she had heard "how peaceful it was" in the operating rooms during Eva and Erika's separation and reconstruction. Now, however, the girls' mother is excited to get "more gray hair." "They always say, 'When you have twins, you're going to go crazy because one's over here, the other's over there," Aida Sandoval said. "I want to go chasing after one that way and then go chasing after the other. That’s something I do look forward to doing."